Hyaluronic Acid, or HA, is a compound present in every tissue of the body, with the highest concentrations occurring in connective tissues such as skin and cartilage. Hyaluronic Acid is an important constituent of joint fluid where it serves as a lubricant and plays a role in resisting compressive forces. It is great for those who need to ease the flexing of their joints, especially their knees and fingers, by restoring cushioning to their joints. 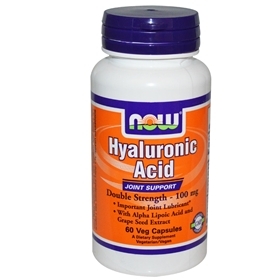 Hyaluronic Acid is present in every tissue of the body, particularly in the synovial fluid. This fluid bathes the joints, the fluid in the eyes, and in the skin. Water retention is one of the most important biological functions of hyaluronic acid, as well as providing nutrients and removing waste from cells. Cartilage does not have a direct blood supply, so when there is less than adequate amounts of hyaluronic acid, these nutrients cannot be moved into cells and the waste materials are not removed. Hyaluronic acid is especially concentrated in the synovial joint fluid, the eyes, cartilage, blood vessels, extracellular matrix, and skin. HA can be helpful for those who suffer with dry eyes. Our joints are surrounded by the synovial membrane, that forms a capsule around the ends of the bones, and secretes a liquid called the synovial fluid. This fluid is found in joint cavities and has many functions, serving as a lubricant, shock absorber and a nutrient carrier, protecting the joints and bones. When you step down, this fluid provides a cushioning effect to the compressive force, and you feel better. Cartilage is a type of connective tissue that gives strength and flexibility to the body, but since it has no blood vessels, it relies on the nutrients that are brought by the synovial fluid. Cartilage is a smooth, slippery substance inbetween the bones, so having adequate cartilage, HA, and synovial fluid is all important for joint health. Hyaluronic acid provides cushioning in the joints, helping to carry the all important nutrients, that nourish and replenish cartilage. The skin is composed of hyaluronic acid, collagen & elastin, and holds large amounts of water. Elastin must be bathed in water or it becomes dry and brittle, and results in wrinkled skin. HA content in the skin changes as we age, and we can help reverse this process by applying it topically, and taking it internally. It is essential for the structure of the extracellular matrix in the skin, insuring that the matrix has the ability to hold onto its essential fluid. This ensures hydration of the skin, making it look smooth and youthful. Suggested Usage: As a dietary supplement, take 1 Vcap 1 to 2 times daily, preferably with meals. Consider taking this product in combination with NOW® Glucosamine, Chondroitin and MSM. Het verbetert de kwaliteit echt van de huid.